Dental implants are designed to provide a foundation for replacement teeth that look, feel, and function like natural teeth. The person who has lost teeth regains the ability to eat comfortably and smile with confidence, knowing that teeth appear natural and that facial contours will be preserved. Implants are tiny titanium posts that are placed into the jawbone where teeth are missing. The bone bonds with the titanium, creating a strong foundation for artificial teeth. In addition, implants can help preserve facial structure, preventing the bone deterioration that occurs when teeth are missing. Dental implants improve quality of life! With them, people are rediscovering the comfort and confidence to eat, speak, laugh, and enjoy normal day to day activities. Dr. Roane has received extensive training in Implantology. He is abreast of the most current information on implant dentistry. If you feel implant dentistry is the choice for you, we require that you undergo a dental/radiographic examination and health history. During this consultation, Dr. Roane will address your specific needs and considerations. Your questions and concerns are important to us, and our team will work with you very closely to help make your procedure a success. We will also discuss fees and insurance at this time. Dental implants are titanium anchors that act as tooth root substitutes. They are surgically placed into the jawbone. Small posts (abutments) are attached to the implant to provide stable anchors in the gum for replacement teeth. 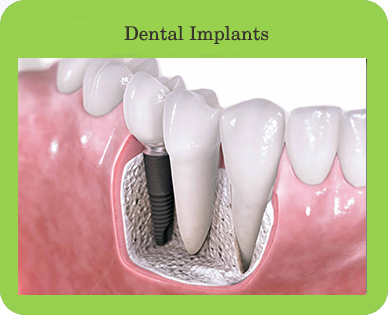 For most patients, the placement of dental implants involves two surgical procedures. First, implants are placed within your jawbone. Healing time following surgery varies from person to person and is based on a variety of factors, including bone density. An average healing time is four to six months in the upper, and two to four months in the lower. For the first two to six months following surgery, the implants are “sleeping” beneath the surface of the gum, gradually integrating with the jawbone. You should be able to wear temporary dentures and eat a normal diet during this time. During this time, your restorative dentist designs the final crown, bridgework, or denture that will ultimately improve both function and aesthetics. After the implant has integrated to the jawbone, the second phase begins. Dr. Roane will uncover (expose) the implants and attach a small healing collar. After two weeks your general dentist will be able to start making your new teeth. An impression must be taken. Then posts (abutments) can be connected to the implants. The teeth replacements are then made over the posts. The entire procedure usually takes six to eight months. Most patients do not experience any disruption in their daily life.